The Dallas Cowboys utilized an awe-inspiring first drive by QB Dak Prescott and WR Dez Bryant to hold off the Indianapolis Colts, 24-19 on Saturday night. With no Ezekiel Elliott in the backfield, Cowboys fans got a good taste of what life may be like for however long their standout second-year player will be suspended as four Dallas running backs notched at least five carries. Andrew Luck didn’t play for the Colts, and former Miami Hurricane QB Stephen Morris kept the game interesting in the final moments, but Dallas outlasted Indianapolis in the end. With that we give you our PFF exclusive takeaways from the contest for each team. 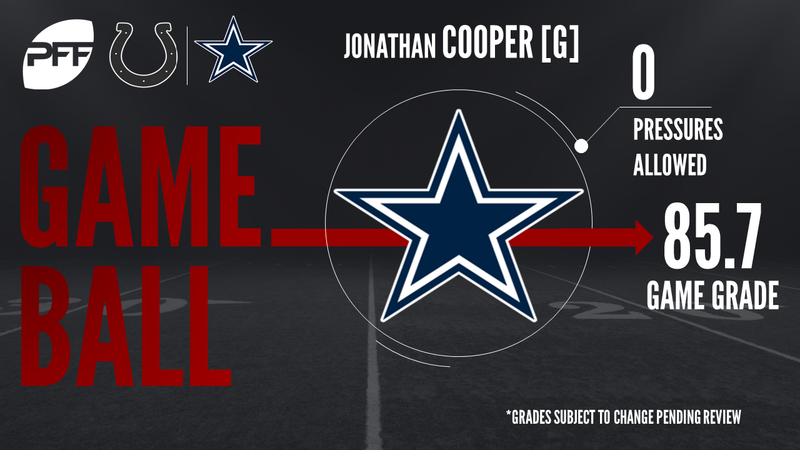 While the entire Cowboys’ offensive line was in midseason form both in pass protection (no hurries allowed, only hurry against Prescott came against tight end James Hanna) and in the run game, Cooper excelled while playing a game-high 56 snaps. He’s one of the biggest question marks up front for Dallas and he didn’t give up a pressure while making a number of key blocks in the run game, showing great balance and positioning to open up holes. He finished the game with an 89.1 grade in pass protection. Prescott looked sharp in his first preseason action, hitting open receivers and taking advantage of clean pockets on seven of his eight dropbacks. His only incompletion was batted at the line of scrimmage and his only pass thrown beyond 10 yards was a back-shoulder throw to WR Dez Bryant to won at the catch point and took it in for a score. Business as usual for Dak and the Cowboys’ passing game, though they’re sure to get challenged both up front and on the back end in future contests. Scandrick logged just nine snaps in coverage, being targeted just once, but not allowing a reception. In doing so, he saw just a 39.6 passer rating on throws into his coverage. Wilson was equally impressive in run defense, as he was in coverage from his linebacker spot. He finished with a team-high run defense grade of 79.7 and was targeted two times on nine snaps in coverage, allowing just one reception for four yards. Mack finished the game with not only a team-high grade, but also a game-high run grade of 81.9. He forced five total missed tackles on just seven total touches and an incredible 542.9 elusive rating. Albeit a small sample size, the rookie from USF looked impressive touting the ball against the Cowboys. Pope put forth another impressive outing for the Colts, finishing with a game-high 90.4 receiving grade against Dallas. While he didn’t log a single carry in the game, he did force five missed tackles on just three receptions. His five missed tackles forced on receptions are more than any other running back has forced on receptions this entire preseason to date. After a rough rookie season at safety, Green is trying to find his way as a cornerback where his length and speed make him an intriguing prospect. He had his ups and downs in this one as he got his hands on one deep ball to break it up, but also got beaten on another “go” route by Lance Lenoir while picking up a facemask penalty after giving up a first down conversion on a crossing route. He saw a 73.8 passer rating when targeted in the contest. The Colts’ are going with a see-what-sticks approach with their edge defenders as a number of veterans are vying for playing time and Ayers continues to state a strong case for himself. He picked up a QB hit and two hurries on 15 rushes, using a strong bullrush to push the pocket. Ayers had 12 total pressures on 146 rushes last season, and more games like this should put him in the mix for more opportunities on a Colts team that picked up the lowest percentage of pressure in the NFL last season.